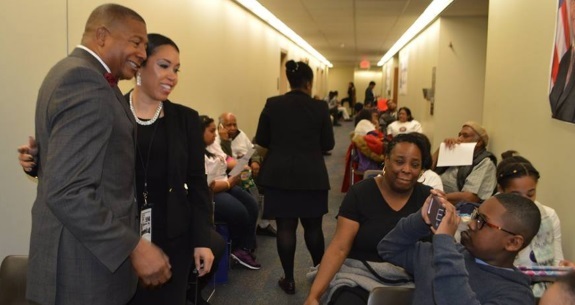 State Senator James Sanders Jr. (D-Rochdale Village, Far Rockaway) took more than 100 constituents on a free bus trip to Albany on Saturday, February 17, 2018 for the annual New York State Association of Black and Puerto Rican Legislators caucus weekend. Guests had an opportunity to meet local and state legislators, attend educational and networking opportunities as well as a youth summit, and had a chance to walk and shop the Concourse Flea Market. They also received a complimentary breakfast and lunch. “I am so glad to see all of you up here, I can’t even put it in words,” Sanders told attendees. “I am glad that you took the trip down here,” Sanders told attendees.“I am so glad to see so many friends that I know, and so glad to see so many friends that I’m getting to know. I’m blessed. Senator Sanders who is the Chairman of the Senate Task Force on Minority and Women-Owned Businesses (MWBEs) hosted four workshops related to the subject during that Saturday. The first workshop was about the renewal and advancement of Article 15-A. The purpose of this part of the New York State executive law is to promote the participation of MWBEs in state contracts by setting fair and equitable goals. The second workshop discussed the Black Wealth 2020 initiative, which focuses on how the black community can go from poverty to wealth. Black Wealth 2020 is an economic agenda drafted by a coalition of business leaders and leaders of national organizations. The goal of Black Wealth 2020 is to increase the collective wealth of Black America by the end of 2020. In order to bring this goal to fruition, Black Wealth 2020 has identified three separate but interconnected initiatives - increase the size of black-owned businesses; increase the number of black homeowners by 200,000; and increase support of black-owned businesses. In line with promoting black wealth in his district, Senator Sanders has started a Financial Empowerment Boot Camp and is presently taking applications for this once-in-a-lifetime program. Qualifying participants are chosen by lottery. This boot camp will give residents all of the tools they need to achieve their dream including learning how to repair or acquire credit, designing a budget and creating a plan for success – one that is specifically tailored to meet the applicant’s needs with the help of expert one-on-one counseling. Classes will be held twice a week for four weeks. The third workshop at the caucus was entitled MWBE Mega-Projects: A Better Way to Include the Community. 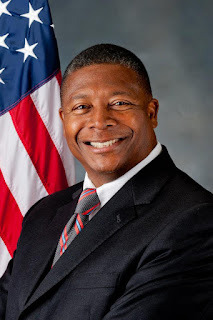 It was a discussion about the participation of MWBEs in present and future projects in New York State such as LaGuardia Airport, JFK Airport, and Moynihan Station and whether the Governor is meeting the 30 percent MWBE contracting goal he has set for the state. The final workshop was entitled Access to Capital for MWBEs, which focused on how these businesses could gain access to city, state and federal funding as well as alternative and institutional lending. As the ranking member on the Senate Committee on Banks and the Senate Committee on Labor, Senator Sanders had extended expertise in all of the panel discussions. This year Senator Sanders was also a Co-Chairperson and Moderator of the Annual Labor Luncheon, an opportunity for union members and leaders to gather together and celebrate their successes as well as to plan for important future causes. We would like to thank our Albany trip sponsors AARP, Jeremiah C.Gaffney's Funeral Home, Joseph & Sons Jewelers, Heal the World Pharmacy, Inc., Delta Airlines and Richie Rich Palace.